Now come reports from various protest locations that reveal a substantially coordinated effort, and not the organic grassroots showing by concerned Americans, as the mainstream media is reporting. Photos from Austin, Texas reveal a line of busses the “protestors” arrived in, making their appearance seem substantially less than organic – with a direct implication of being strategically orchestrated. With evidence mounting, the question must be asked; is George Soros working through his front organizations to foment an American revolution? Note that the group is actively organizing protests to a democratic election that no one is contesting the legitimacy of in terms of whether the vote was rigged, etc. Essentially, they are displeased with the results and are calling for people to rise up and not accept the results. For an organization that feigns to promote democracy, their actions speak otherwise. Perhaps the most absurd part of the protests is that President-elect Trump hasn’t made a single policy decision yet — and, in fact, the entire section of his website regarding banning Muslims was scrubbed shortly after his election. This denotes that anything said during the campaign was most likely simple election campaign rhetoric and subsequent framing of said rhetoric by the opposition. The left wing organization is one of a number of progressive organizations affiliated with Soros’ Open Society Foundation. 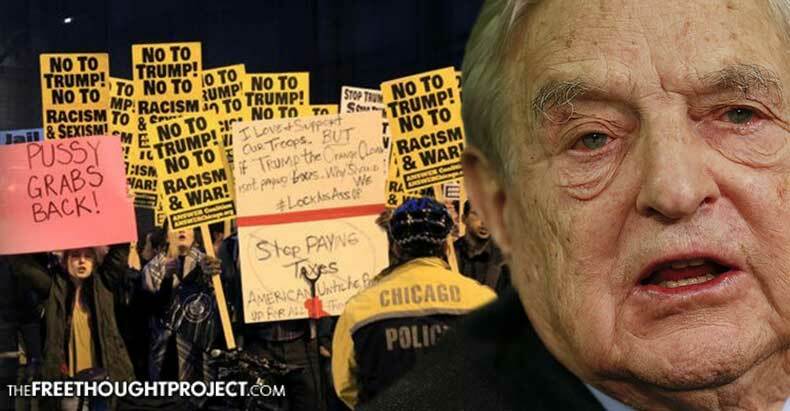 Soros-affiliated organizations across the world are deeply connected to various color revolutions, the Arab Spring, and a number of other political uprisings across the globe. During the 2016 presidential cycle, Soros committed $25 million dollars to the 2016 campaign of Hillary Clinton. Per the standard Clinton operating procedure, this was indicative of the symbiotic relationship of favors between the billionaire and his array of political puppets across the globe. As a testament to the power wielded by Soros, contained within WikiLeaks’ recent release of hacked DNC emails, is a message from billionaire globalist financier George Soros to Hillary Clinton while she was U.S. Secretary of State, that clearly reveals Clinton as a Soros puppet. Make no mistake that the events you’re seeing transpire nationwide are being orchestrated in part by a billionaire political elite class that is looking to subvert the will of the American people by attempting to foment a new American revolution. Soros’ formula has been duplicated in numerous nations, and it looks as if he now has the U.S. in his sights as the next target. Please share this critically import story in hope of waking people up to the globalist agenda at work here in America! *Update – The buses in Austin were not related to the protests.